CORSA exhaust price increase is coming. Corsa Performance has recently announced a price increase to take place soon. 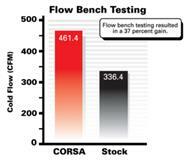 This affects all Corsa Performance exhaust dealers and you will see this reflected in the advertised prices going up. This has not happened yet, but this is your last chance to get Corsa Performance exhaust systems at the old price. [ CLICK HERE ] for all Corsa Performance exhaust offerings. Performance exhaust systems, available for most current BMW models, provide a pleasing “sporty” exhaust tone, improved appearance, lighter weight, and genuine power increases. · Sporty yet refined sound. · Lower weight for better performance. · Will not rust, made of 100% stainless steel. Co-developed with Corsa Performance and based on their exclusive Reflective Sound-Cancellation™ (RSC™) technology, each system is 100% stainless steel and made in USA. These are undoubtedly the absolute best "refined and sophisticated sounding" performance exhaust systems available. CORSA is one of the largest automotive and high-end marine exhaust tuning companies in the USA with engineering and manufacturing facilities in Ohio. The result of CORSA's extensive research and development for the BMW models is the new drone-free series of RSC™ exhaust systems, delivering pleasant sound at idle and cruise, and a muscular roar at high rpm. CORSA tuned these systems specifically to counter drone. Sound pressure waves are reflected within the muffler case and unwanted noise frequencies are canceled through patented Reflective Sound Cancellation™ technology. 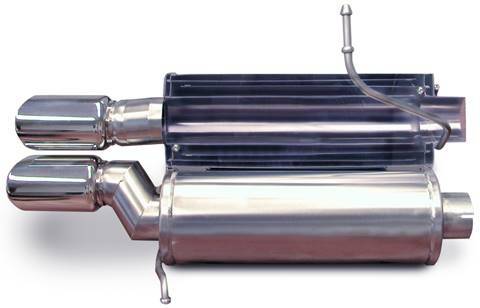 The result is a tuned muffler that produces the best sound and performance possible. No Resonance/Drone... due to our patented Reflective Sound Cancellation™ (RSC™) technology; your exhaust is whisper quiet at highway speeds. Increased Horsepower and Torque... resulting from a straight-through design, increased flow and less backpressure. Reflective Sound-Cancellation™ (RSC™) - a non-electrical noise control system without the complication of incorporating the use of electronics or speakers. Essentially, engine sound (pressure) waves are reflected in passages inside the muffler, inverted within tuned chambers, and reflected back into the primary exhaust stream. Overlaying this inverted sound wave over the original effectively cancels out that tone. The system is designed in this way to cancel out the unwanted “drone” sound waves at cruising speed / engine load. The result is a "tuned" muffler that "cleans up" the noise without eliminating the pure sound of power associated with a high-performance vehicle. Using this Corsa technology, the stainless steel Corsa Performance line of mufflers is tuned to eliminate passenger cabin resonance and produce just the "right" sound. Complete cat-back midpipe and rear section. Q: Will my car pass emissions? A: Yes, emission control systems are completely unaffected. None of the UUC/Corsa systems affects any catalytic converter or other federally mandated emissions-control components. Q: Do I need to have new software installed? A: No, the BMW computer (DME) is completely adaptive and will make all adjustments as required within a short period. Q: Is there any welding involved in installation? A: No. All systems are either a direct bolt-on design or slip-fit with clamps and are completely reversible. Q: Do you provide installation instructions? Will I need additional parts? A: Fully illustrated instruction guides are provided with every exhaust system, and any additional parts or hardware are provided. Q: Is the exhaust very loud, will I get “excessive noise” tickets? A: All UUC/Corsa exhaust systems are designed to be very quiet and “mellow” at cruising rpm/speed and will not be intrusive on normal in-car conversation. At full throttle, the sound is dramatically more aggressive but is generally compliant with the sound restrictions in most municipalities, and some are certified compliant with the SAE J1169 noise level standard. Local municipal and state laws may vary. Q: What is the warranty on the exhaust? A: All Corsa systems are covered by a limited liability lifetime warranty to the original purchaser.